Over the last few years new health stores and local farmer’s markets have been springing up everywhere and buying organic fruit and veg, in order to avoid synthetic pesticides, has become a huge trend. But what do you do if the only cucumber or pepper, which is available, has been conventionally grown? Do you buy it or do you leave it on the shelf? What do you do if buying everything organic is simply too expensive? When you have to make this choice, it is best to consult the Dirty Dozen and Clean 15 lists which are published by the Environmental Working Group (EWG). The Dirty Dozen list names 12 fruit and vegetables with the highest pesticide residue. In the last 2 years, the Dirty Dozen list has been supplemented by a category called Dirty Dozen plus which names additional 2 fruits or veg that have not made the Dirty Dozen list but are particularly high in pesticides. In 2013 the two extra vegetables included kale / collard greens and summer squash. 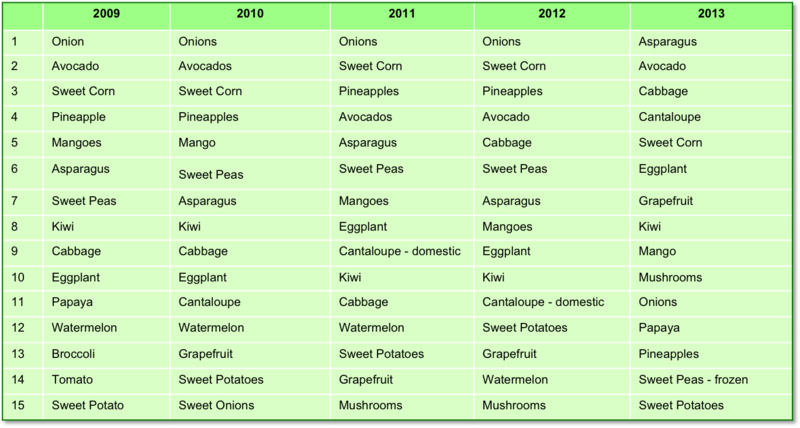 In 2012 the list included green beans and kale/collard greens. The Clean 15 list names 15 fruit and vegetables that have the lowest pesticide residue. So when you have to make a decision about what to buy use these lists. If the fruit or veg that you want to buy is part of the Dirty Dozen list, the EWG recommends buying it organic.